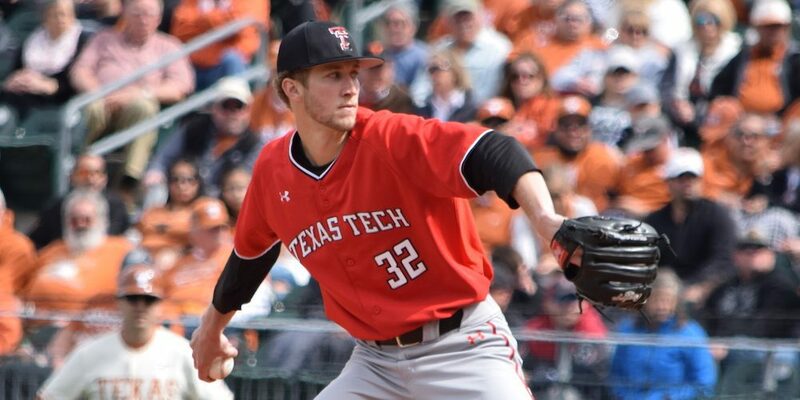 AUSTIN, Texas — Texas Tech righthander Caleb Kilian has no trouble putting the team on his shoulders. As the innings progressed Saturday afternoon, it was evident the 6-foot-4, 180-pound righthander would have to be special. Texas won the series opener over the Red Raiders on Friday, and his childhood friend, Texas righthander Blair Henley, was putting together a gem of his own on the other side. Henley wanted to nail down a series win in the worst way. Kilian usually can count some hefty run production to take some pressure of his game, but not with Henley dealing. So, the veteran righty went to work and put together his strongest start of the season in a 3-0, one-hit victory over the Longhorns to even the series. Coming into today, it was easy to be confused with what to expect from Kilian. The righthander tallied a 3.234 ERA in 72.1 innings of work last season and was expected to form into a premier Friday night ace this spring. However, the first four weeks weren’t especially kind to him. Kilian allowed six runs in 3.1 innings in the season-opening series against Oregon, he allowed three runs in 4.1 innings against Kentucky, two runs in 3.2 innings in a loss to Mississippi State, and six runs on seven hits in 4.1 innings against Wichita State last weekend. So, it’s natural to wonder which Kilian would show up, though Texas Tech coach Tim Tadlock didn’t think last week’s stat line showed show the true story of his performance against the Shockers. “You know, I really thought he was good last week. I thought his line didn’t really reflect anything about how he pitched last week,” Tadlock said. “Maybe the easiest way to explain it, we handed out some free 90s [walks]. We had some double play balls out of order and things like that. The Longhorns didn’t have many scoring chances against Kilian, but when they did early in the game, he made big pitches and avoided trouble. Kilian retired the ‘Horns in order in the first before things got dicey in the second. Zach Zubia led off the inning with a single before Kilian got a pair of outs. Then, he walked Tate Shaw to put two runners on with two outs. However, Kilian collected himself and punched out Michael McCann on an 83 mph slider to escape. Kilian didn’t face much trouble the rest of the way, and that’s a good thing, because Henley was outstanding for Texas. Henley, a 6-foot-3, 190-pound, junior righthander, has had to fight for his weekend starting job this season. He was inconsistent as a draft-eligible sophomore last season, and wasn’t great in his first two starts, allowing four runs in two innings against Louisiana before allowing six runs in 6.2 innings against Purdue. He pitched much better against LSU two weekends ago before tossing a gem last weekend at Stanford, allowing two runs on five hits in six innings.